Definition at line 20 of file DelayId.h. Definition at line 27 of file DelayId.cc. Definition at line 30 of file DelayId.cc. Definition at line 36 of file DelayId.cc. Definition at line 154 of file DelayId.cc. References assert, DelayIdComposite::bytesIn(), compositeId, markedAsNoDelay, NULL, and pool(). Referenced by Ftp::Client::dataRead(), gopherReadReply(), Http::Tunneler::handleReadyRead(), and HttpStateData::readReply(). Definition at line 132 of file DelayId.cc. 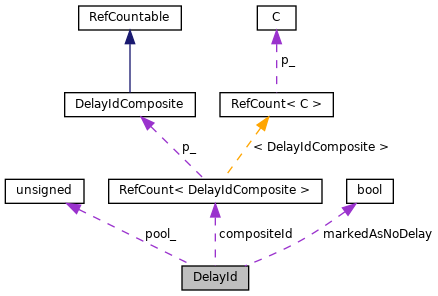 References DelayIdComposite::bytesWanted(), compositeId, markedAsNoDelay, max(), and NULL. Referenced by gopherReadReply(), Http::Tunneler::handleReadyRead(), MemObject::mostBytesAllowed(), and MemObject::mostBytesWanted(). Definition at line 40 of file DelayId.cc. Definition at line 67 of file DelayId.cc. References allow_t::allowed(), assert, HttpRequest::auth_user_request, HttpRequest::client_addr, compositePosition(), Config, ACLFilledChecklist::conn(), DBG_IMPORTANT, debugs, DelayPools::delay_data, SquidConfig::delay_pool_uses_indirect_client, DelayId(), ACLChecklist::fastCheck(), ClientHttpRequest::getConn(), HTTPMSGLOCK(), HttpRequest::indirect_client_addr, Ip::Address::isNoAddr(), ACLFilledChecklist::my_addr, HttpRequest::my_addr, NULL, SquidConfig::onoff, pool(), DelayPools::pools(), ACLFilledChecklist::reply, ClientHttpRequest::request, CompositePoolNode::CompositeSelectionDetails::src_addr, ACLFilledChecklist::src_addr, CompositePoolNode::CompositeSelectionDetails::tag, HttpRequest::tag, and CompositePoolNode::CompositeSelectionDetails::user. Referenced by clientReplyContext::createStoreEntry(), clientReplyContext::doGetMoreData(), clientReplyContext::processExpired(), clientReplyContext::sendMoreData(), Ssl::ServerBump::ServerBump(), clientReplyContext::setReplyToStoreEntry(), statClientRequests(), switchToTunnel(), and tunnelStart(). Definition at line 169 of file DelayId.cc. References assert, compositeId, DelayIdComposite::delayRead(), and NULL. Definition at line 60 of file DelayId.cc. References compositeId, RefCount< C >::getRaw(), and pool_. Definition at line 52 of file DelayId.cc. Definition at line 46 of file DelayId.cc. Referenced by bytesIn(), and DelayClient(). Definition at line 122 of file DelayId.cc. Definition at line 41 of file DelayId.h. Referenced by bytesIn(), bytesWanted(), compositePosition(), delayRead(), operator bool(), and operator==(). Definition at line 42 of file DelayId.h. Referenced by bytesIn(), bytesWanted(), and setNoDelay(). Definition at line 40 of file DelayId.h. Referenced by operator bool(), operator==(), and pool().